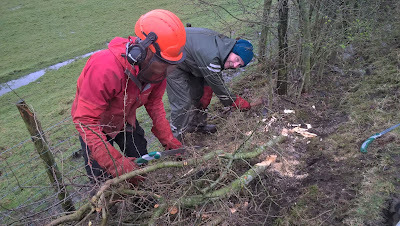 Central & East Lakes countryside team are rightly proud of their collection of interesting specimen conifers at Aira Force (Ullswater), Skelghyll (Ambleside) and High Close (Great Langdale). 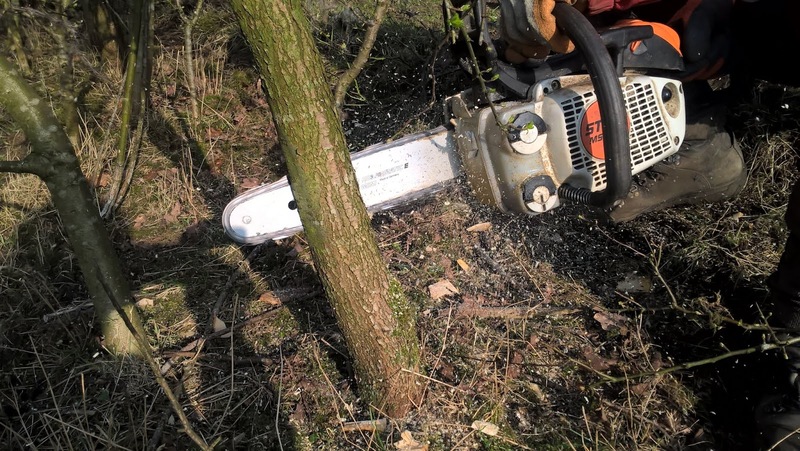 Whilst our ancient and veteran trees in the wider countryside are normally native species, such as oak, ash and alder, we also have a number of notable and rather impressive non-native conifers. You might have seen the magnificent Sitka spruce at Aira, picked up cones from the Monterey Pine at High Close, or got vertigo looking up at the tallest tree in the north-west - a Grand Fir at Skelghyll woods. These 'designed landscapes' are a significant contributor to the cultural landscape that is celebrated in the Lake District World Heritage Status. A few years ago a kind donation allowed us to plant some further specimen conifers at Skelghyll - you can read about it here. 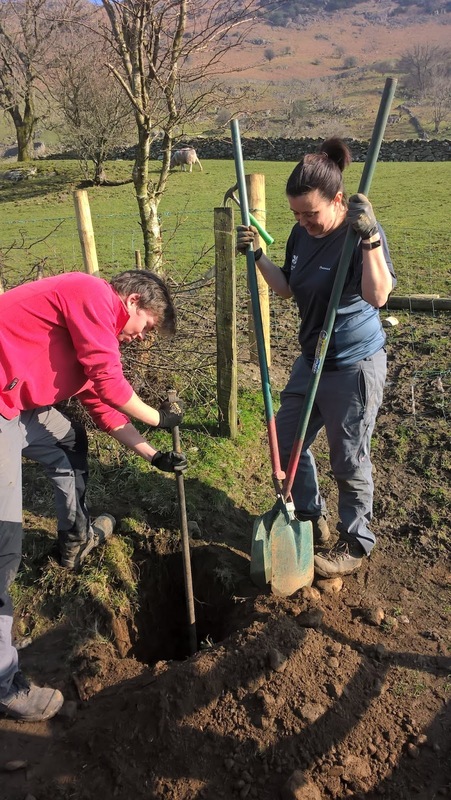 We got the chance to plant further trees thanks to the National Trust's Plant Conservation Centre, who regularly have surplus plants left over from their propagation of unusual or interesting plants from NT properties across the country. 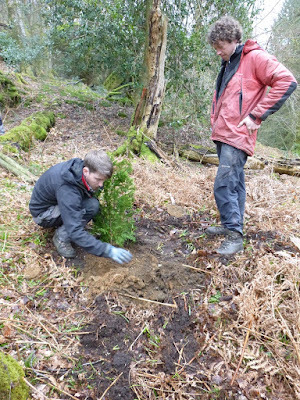 And so, one autumnal day, Central & East Lakes took delivery of a coast redwood (Sequoia sempervirens), Japanese red cedar (Cryptomeria japonica), an ornamental Lawson cypress (Chamaecyparis lawsoniana), Cedar of Lebanon (Cedrus libani) and an Asian fir species (Abies delavayi), all destined for Skelghyll woods. 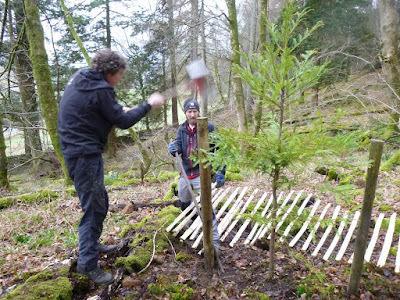 In a change from the windswept mountains, the C&E Lakes Footpath team spend most of the winter helping on lower-level countryside management work, and recently spent a day planting these trees in Skelghyll to complement our other young trees that will, between them, be another generation of specimen conifers. 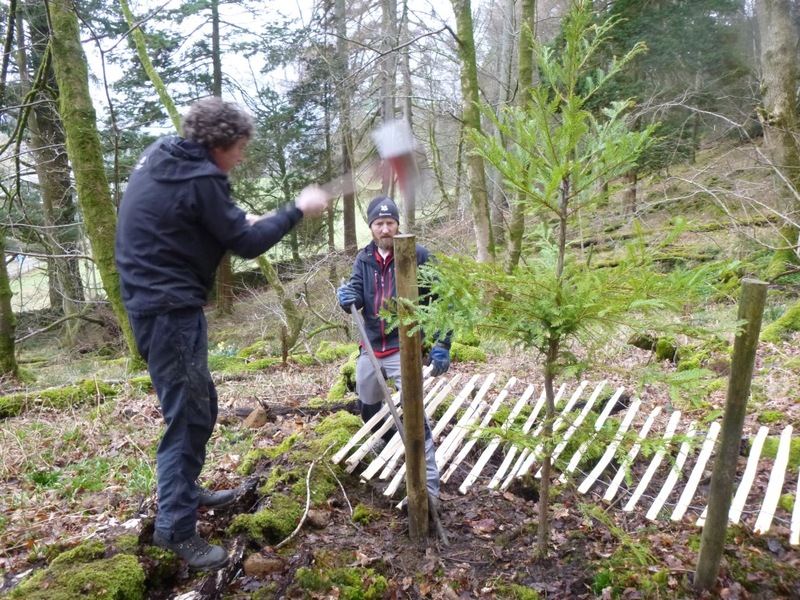 The trees were planted in chestnut paling cages to protect them from roe deer that would otherwise have a nibble. 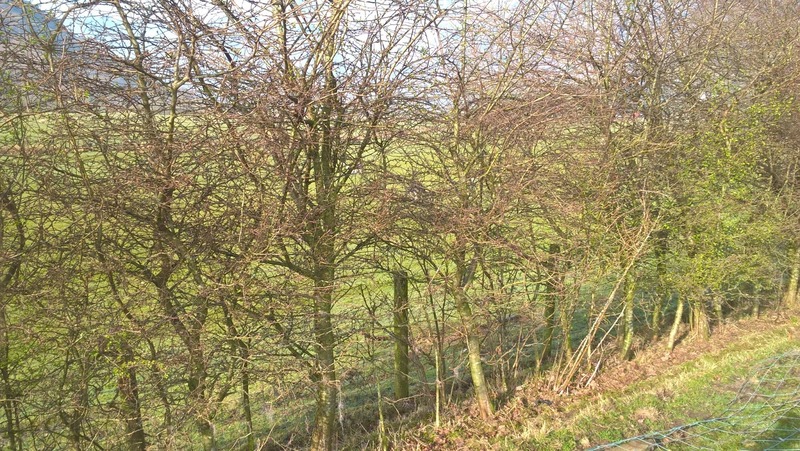 The Cedar of Lebanon, needing a bit more light, will be planted in the adjacent field behind Wansfell Holme to become a more open-grown specimen tree, joining Douglas firs and black pines already in this field below the woodland. Even the oldest of these kind of conifers in the UK are barely teenagers when it comes to those in their natural environments. 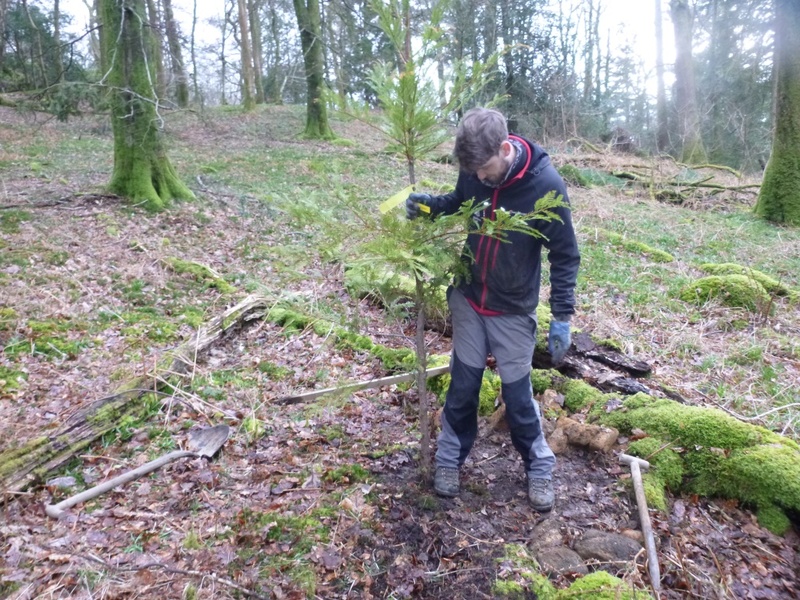 Our impressive spruces, firs and redwoods will be, at most, 200 years old, dating back to the exploits of plant hunters like David Douglas in the early 1800s. Compare this to redwoods of 1,000 or more years old, reaching over 100m tall, and it puts our 'babies' into perspective! Yew wood is strong, dense, and resistant to decay; this has made it ideal for delicate carving work, turnery, and furniture. 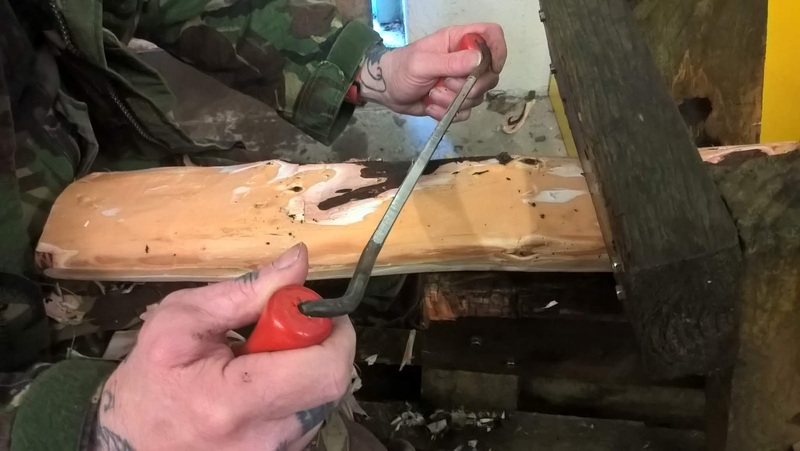 it was famously used for making English longbows given the wood is strong yet flexible. 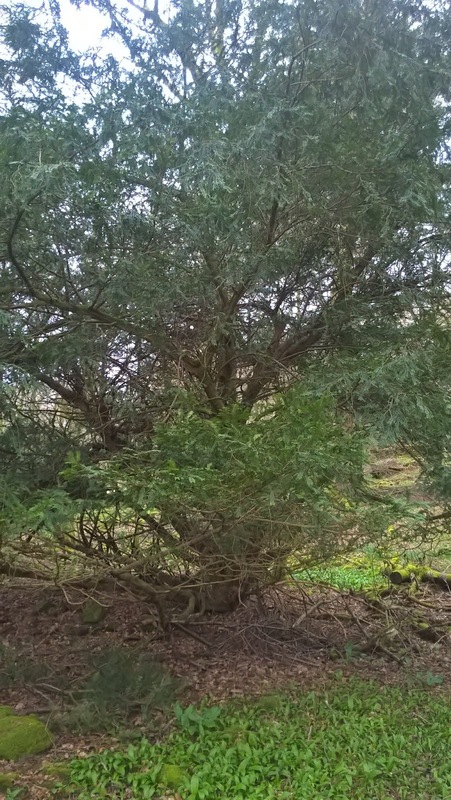 Most parts of yew are poisonous, but the chemical toxin is now being used as a treatment for cancer. Two of the rustic benches, made from yew, at Townend were in need of repair. 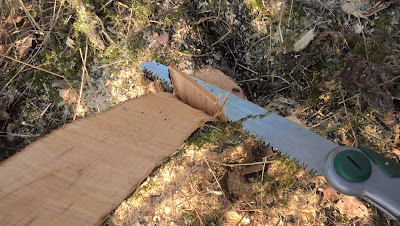 After many years some rot had appeared. 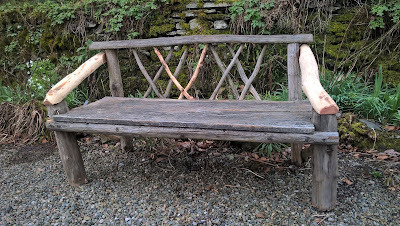 A lower limb of the right shape and size for these bench repairs was removed from a yew in the woodlands at St. Catherine's. Pruning a small branch will be of limited concern to the tree as its strong and decay resistant wood will limit the amount of decay entering the cut. 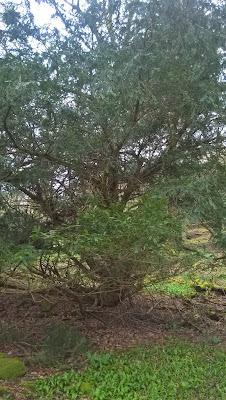 Yews are famously strong at regeneration and unusually for conifers will re-sprout from many points...like deciduous pollards. 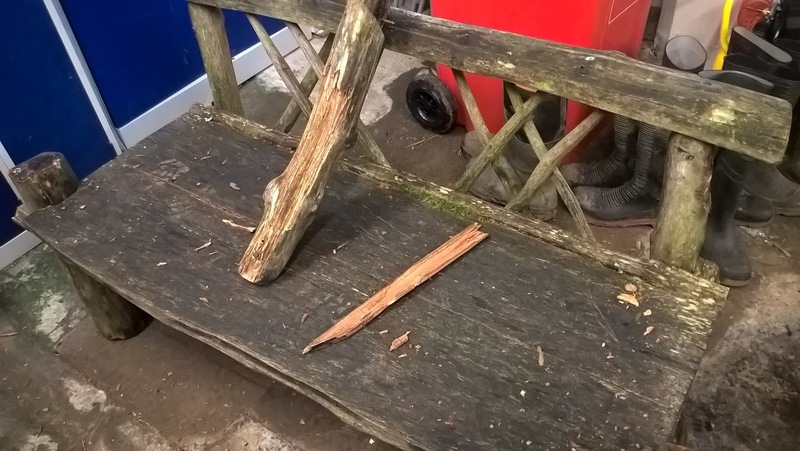 Given the historic use of yew wood for furniture, it seems appropriate to use the branch from a Windermere yew to repair benches made of Troutbeck yew! Long term volunteer, Stuart kindly undertook to do the work. 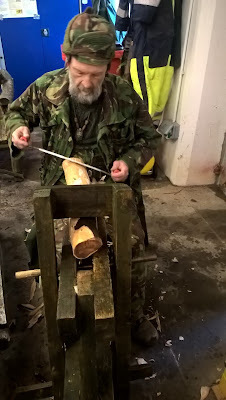 Stuart is using a shave horse, used for green wood-working, at St. Catherine's to clamp the wood in order to remove the bark. 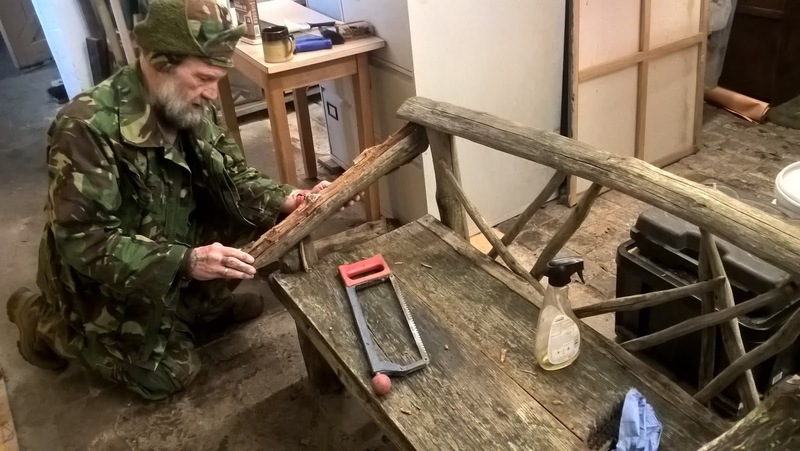 One of the benches repaired by Stuart with two new spindles and arms, ready to be returned to Townend House. Hedge Laying in The Langdale Valley. Hedge Laying originated from the need to keep livestock in fields after the acts of Enclosure in the 16th century. Nowadays more emphasis is placed on the value of the habitat that a well laid hedge can provide for small mammals and birds; hedge laying also promotes traditional skills and they look good in the landscape. 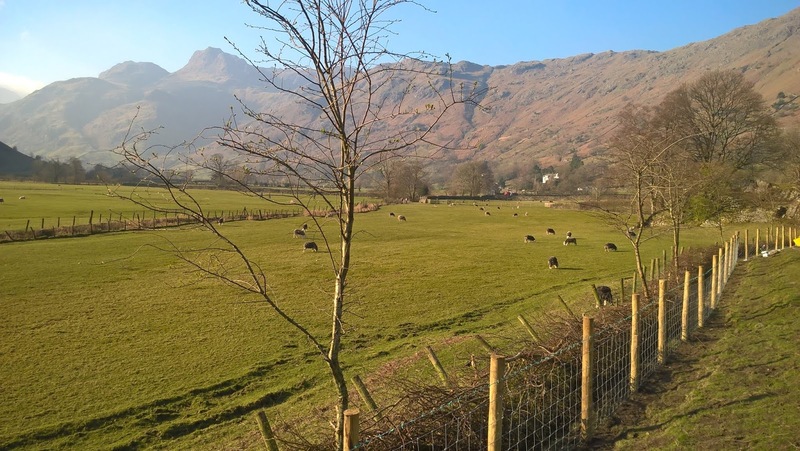 Our main project for February was to lay 135 metres of a hawthorn hedge that was planted 10 years ago at Harry Place Farm in the beautiful Langdale Valley. This also involved taking down the fence on the top side and replacing it with a new fence. A close up of the hedge and the old fence; as can be seen the posts have become very rotten and unstable! With the fence removed the hedge laying begins. An axe or a bill hook is used to partially cut...a technique known as pleaching... into the back of the stem at an angle to just above ground level. 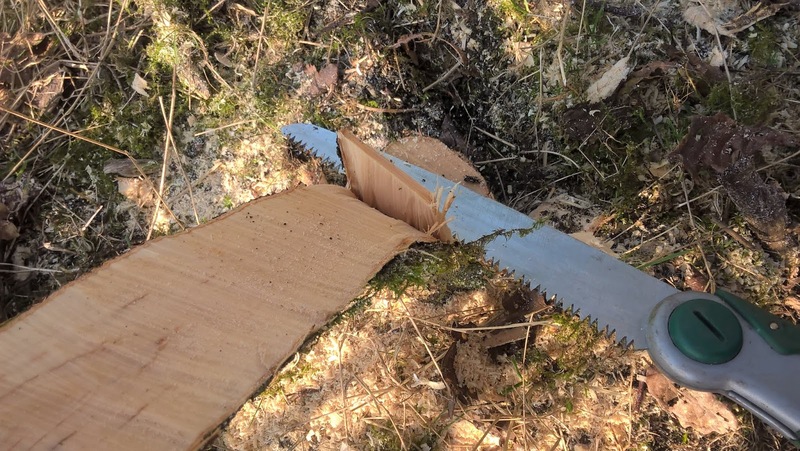 The trick is to leave enough sapwood and bark for the stem to flourish and yet make the stem pliable enough to be be be laid down. 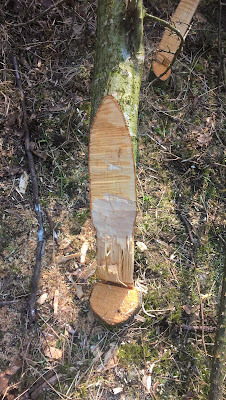 On thicker stems a chain saw is used to speed up this process. 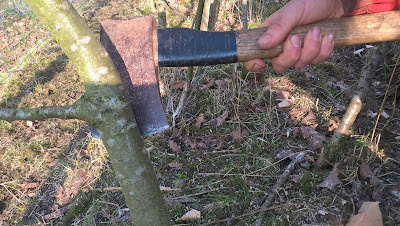 A pruning saw is used to cut back to the remaining section of the stem, know locally as a ligger, once it is laid. 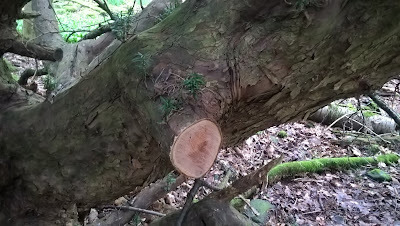 A view of the ligger and the partially coppiced stump from which new growth will usually occur to be laid in years to come. The hedge is taking shape . 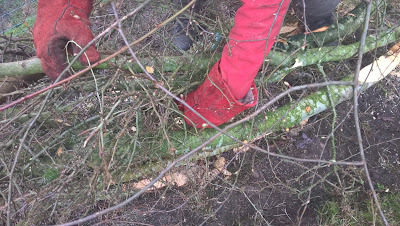 Weaving in the branches and twiggy bits . 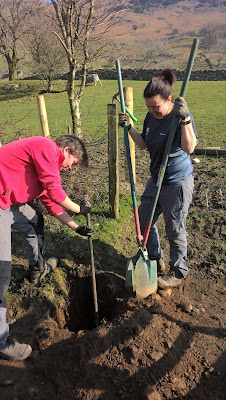 Starting on the new fence by digging a hole for one of the strainer posts. 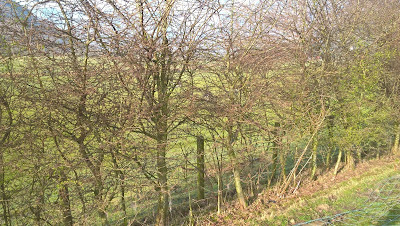 The newly laid hedge complete with hedging stakes hammered in alternately on either side; they are used to "train" the hedge, give it strength, and to keep it to a required width. 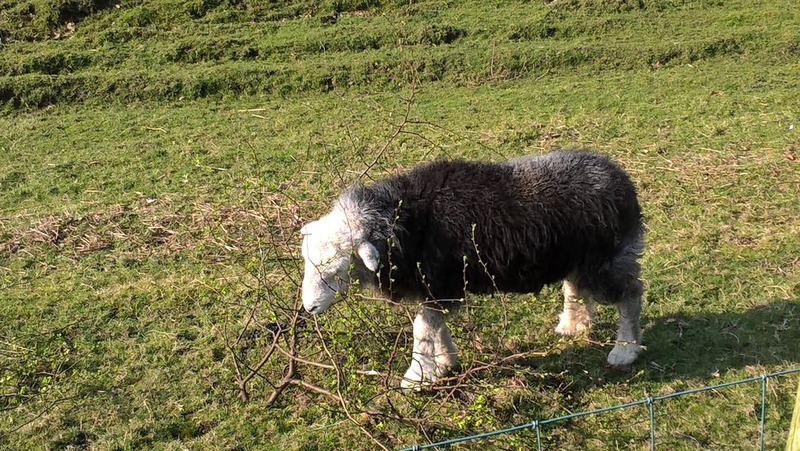 A Herdwick sheep enjoys munching on a discarded branch from the hedge laying. 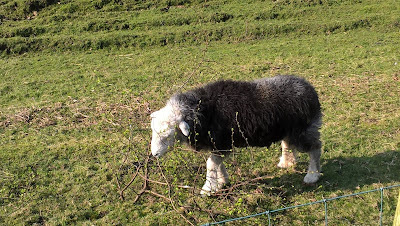 Incidentally, Herdwick is derived from the old Norse Herdvyck meaning sheep pasture! 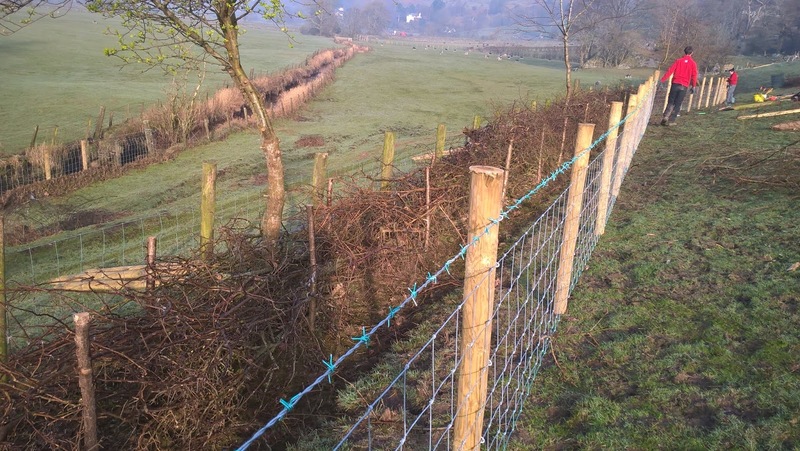 The completed hedge with one of the larger hawthorn trees left upright as a "standard" with a view of the Langdale Pikes and Blea Rigg.